This is undoubtedly the classic walk in the Yorkshire Dales, taking in the summits of Pen Y Ghent (694m), Whernside (736m) and Ingleborough (723m). Meet at Tesco, Parrswood, East Didsbury, where we will be car sharing. Without Adventure What Is Life! Saturday 14th May is your next challenge, we will be driving there and back in one day so come on join us. The walk will commence in the village of Horton on Ribbleside at 7a.m and will end in the same place within 12 hours. Although walkers will often not be too far from civilisation, this long walk is still demanding, and is not a waymarked route. This is undoubtedly the classic walk in the Yorkshire Dales, taking in the summits of Pen Y Ghent (694m), Whernside (736m) and Ingleborough (723m). 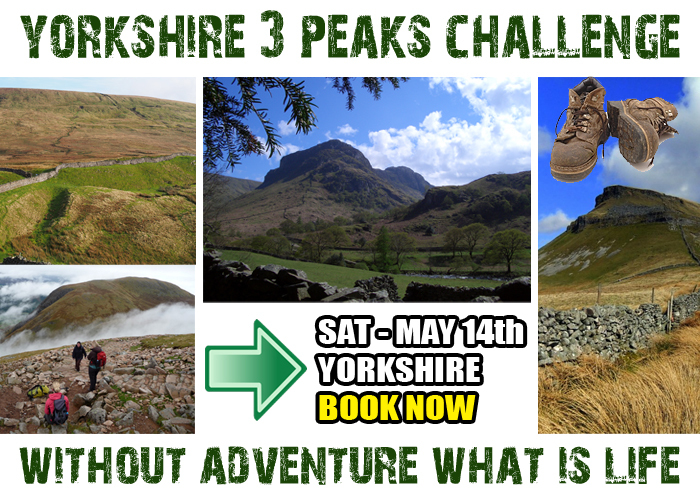 Please take note – this walk is challenging and is not for the faint hearted! Leaving Horton in Ribblesdale, the walk takes us on a superb circular of the hills, firstly with a trek to Pen y Ghent via Brackenbottom, through fields until we reach and scale the imposing face of the hill to the plateau on top. From here, we will cross the Horton Moor and follow a track and the B6255 to Ribblehead Viaduct and prepare ourselves for the long haul up Whernside with a cup of tea at the refreshments van. From Whernside it’s down a steep path to Philpin Farm which has a welcome refreshment pub before the final summit up Ingleborough. Then it’s a six mile walk back to Horton. Hiking boots must be worn, this route is over rough ground, and inadequate footwear will not be acceptable! Good, well broken in walking boots are essential, comfortable trousers/shorts (no jeans), waterproofs, fleece, hat, gloves, sunscreen lotion, packed lunch, water, flask tea/coffee".